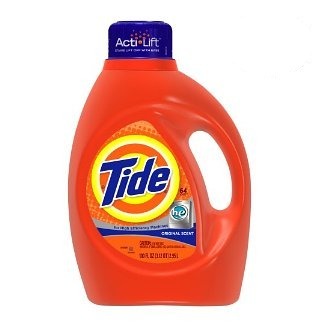 Dodi has provided this Tide liquid detergent with Actilift review. I use Tide liquid. I have always used Tide. When my children were little and I was struggling to support them I tried other laundry detergents and they caused rashes on my children. No matter how little I have to spend I will not change my mind and use another detergent. Since Tide added Actilift I no longer need to use any stain lifters either. I used to use Oxiclean or baking soda in my laundry, but when I ran out I found that there was really no need. I seldom buy the same formula of Tide liquid detergent. Instead, I just buy whatever I grab off the shelf. I have used Tide with Downy, with Febreze, with bleach alternative, and every scent made. My clothes are always clean and fresh. As my children were growing up a major concern was cleanliness. I do not like going to a store and seeing filthy little kids running around. My children were always clean and Tide was a major factor in this. My parents always made comments on how clean the children's clothes were, no matter what age they were at the time. There is nothing better at getting out the stains of baby spit-up, or a diaper issue. My grandchildren now wear many of the clothes that my children wore over 20 years ago. I firmly believe that this would not be the case if I had used a cheaper detergent. I have used the Tide stick when I knew that it would be a while before I would be able to launder a garment that had a stain that could be difficult to remove. I have used Tide for over 25 years and fully intend to use it for many more to come. My children use Tide, as I'm sure will my grandchildren. In our household, we do not dispose of clothing because of stains or laundry issues, we only do so because of them wearing out or being outgrown. Thanks Dodi for your Tide liquid detergent with Actilift review. I would be interested to hear from others about how Tide's addition of Actilift has impacted their use of other stain removers, when cleaning their clothes. You can tell me about this, or any other thoughts you have about Tide detergent, by sharing your Tide detergent reviews here. In addition, you can read other reviews of Tide already submitted. In addition, you can share your other laundry detergent reviews here, telling me which detergent you like (or don't) here, and why. Tide Liquid Laundry Detergent Is A Mother's Best Friend! Suzanne, my friend who writes at the website above, shared her review of Tide liquid laundry detergent. I recently read many of your site reviews about Gain - I had no idea Gain had such a following! I'll have to try it out. That said, my personal current favorite is Tide ... any liquid version of Tide. While more expensive than most other liquid brands, Tide gets the stains out of my daughter's white socks the best. 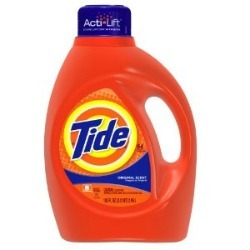 In my opinion, Tide is a "mother's best friend" in the laundry room! Thanks Suzanne for sharing your Tide liquid detergent review. I know what you mean about dirty white socks. My children love to run around in sock feet, and they quickly get a dirty tinge to them that many detergents just can't seem to get rid of. Tide has lots of stain removers within it, as you may know, which they call "ActiLift." That is one thing that I think is an advantage of modern detergents, which is that many of them actually fight stains themselves, without having to add additional products -- but unfortunately, that will only get you so far. I actually just did a test of a stain remover and as my "control" test, I washed the same stains also in Tide detergent, which is what I am currently using for my own detergent. It got a few stains out without any pretreating with a laundry stain remover at all actually. Here is the link to the results of my Tide stain remover test, which shows what stains came out, and which didn't. ***Update - Suzanne wrote me again later with another review, this time of Tide with Bleach, and she wasn't so pleased this time. Here is her story of how Tide with Bleach ruined her towels. Does anyone else use Tide for their laundry? If so, I would love to hear your thoughts about it too. You can share your Tide detergent review here, or read other reviews that have already been submitted. Tide with Actilift is the only detergent I have ever found that will wash out/away dog hair from my clothes, their bedding, my bedding, any thing that you can put in the washer. I have tried everything for more years than probably most of you reading this are old. Vacuuming, prewashing was my only option until I found my preferred Tide with ACTILIFT, it works without the need for any pretreatment or additives. Doggies are a lot happier too that some of their favorite things don't have to be thrown away. While many people like Tide liquid detergent with Acti Lift, not everyone is a big fan of it. I received this review from Carla, sharing her bad experience with this detergent. I have used many versions of Tide and have experienced lots of ruined damaged clothing. Proctor and Gamble have been good enough to re-imburse me for some damages, but I still lost some clothing that I really liked. Yesterday I used Tide with Actilift to try and get a small stain of pomegranate out. I wet garment and put Tide on the stain and gently rubbed, but the stain was still there. I soaked the garment in Tide and water for several hours, and the stain was still there. I then poured Tide on the wet garment on the stain and let it sit. Result........garment ruined with optical bleaching! Tide is one of the most expensive detergents to buy and I am getting sick of the claims that it cleans better, removes even set in stains....all I have to show for it is a lot of ruined clothing and it is great if you want a lot of faded darks (even after using Tide for dark colours)!!!!!! I hate to think what they actually put in this stuff. I'm sorry you had this experience Carla. That is definitely a danger when you let a stain remover, or a laundry detergent that contains a stain remover, sit on clothing too long. It doesn't make it any less aggravating though, when it happens. Has anyone else had a problem using Tide liquid detergent as a stain remover? I know that I used it as a "control" in some of my stain removal tests, when testing stain removers, and actually didn't think it worked significantly better for stain removal than other brands. You can read my entire Tide as stain remover results here (with before and after pictures). You can share your Tide detergent reviews here, or read others that have already been submitted. Stain Remover Reviews: Which Products Work Best?